PawHut 46" 36" Soft Folding Pet Playpen Dog Exercise Pen Fence Cage Kennel Crate. Stylish, portable, lightweight and well-built, our soft pet playpen offers pets both the comfort and security they need and the freedom they deserve. It can keep a puppy away from potentially dangerous household items, like poisons, electrical wires, etc. The playpen can be used around the house to confine pets to a specific area, but is also great for play, exercise and house training. Our pen can also be used as puppy pen, whelping pen, playpen, petting pen, or training pen. Our soft pet playpen is constructed with a strong internal steel frame and durable 600 D oxford cloth. Uniquely crafted to meet your home and travel needs, because it sets up in seconds yet folds easily and stores in a carrying case. Our model features a zippered waterproof bottom, designed to prevent escape and to protect your floors from accidental messes. 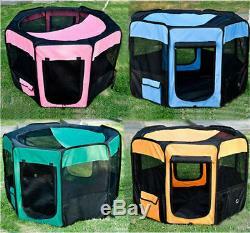 Pop-up pet playpen Folds completely flat and is very lightweight and portable Sets up in seconds Uniquely designed to meet your home and travel needs Large diameter - eight panel shell Strong internal steel frame Durable waterproof 600 D oxford cloth material, easy to clean (2) Zippered roll up doors for convenient access Zippered half mesh cover for shade and security Zippered bottom prevents your pet from escaping Waterproof bottom protects your floors from accidental messes Mesh on all sides for air flow and visibility Attached band for holding a water feeder bottle (bottle not included) (2) Side storage bags (4) Metal stakes for holding the pen on ground firmly (outside use) Carrying bag for easy storage and transportation. Color: Pink Playpen Size: 46" (longest diameter) × 29 3/4" tall (highest point), Panel Size: 22 3/4"W × 28"H. Color: Blue Playpen Size: 46" (longest diameter) × 29 3/4" tall (highest point), Panel Size: 22 3/4"W × 28"H.
Color: Green, Playpen Size: 46" (longest diameter) × 29 3/4" tall (highest point), Panel Size: 22 3/4"W × 28"H. Color: Orange Playpen Size: 36" (longest diameter) × 23" tall (highest point), Panel Size: 17 3/4"W × 23"H. We are committed to offering our customers value-oriented items in Outdoor & Patio, Home Goods, Health & Beauty, Sporting Goods, Pet Supplies, Toys & Hobbies. We are always looking tobring new innovative items to our catalog so contact our Customer Service department with any suggestions you may have! Please verify that this address is the correct one you wish to have your package sent to. How long will it take to get my item? In this day and age, we understand peoples time is valuable, so if there is an issue of damage, please supply pictures when you message us to help us assist you faster. This listing is currently undergoing maintenance, we apologise for any inconvenience caused. The item "PawHut 46 36 Soft Folding Pet Playpen Dog Exercise Pen Fence Cage Kennel Crate" is in sale since Tuesday, October 15, 2013. This item is in the category "Pet Supplies\Dog Supplies\Fences & Exercise Pens". The seller is "mhcorp" and is located in United States.